An all-India survey on governance issues and voting behaviour 2018 by the civil rights organization, the Association for Democratic Reforms (ADR), claiming to be the largest-ever voter survey in any country, has said that the top voters’ priorities were employment and basic amenities (like healthcare, drinking water, better roads etc. ), and governance issues (including terrorism and strong defence/military). The three main objectives of this survey were to identify the following: (i) voters’ priorities on specific governance issues, (ii) voters’ ratings of the government's performance on those issues, and (iii) factors affecting voting behaviour. The survey highlights the voters’ priorities on 31 listed issues like drinking water, electricity, roads, food, education, healthcare, public transport etc. in their respective regions in terms of its capacity, governance and specific role in improving their living conditions. For assessing this, voters were asked to list their top five priorities. These voters’ priorities were further analyzed in relation to the performance of the Government on those issues as perceived by the voters. A three-level scale of Good, Average and Bad was used, where Good was given weightage equal to 5, Average was weighted 3 and Bad was weighted as 1. It is quite clear from the top 10 voters’ priorities that Indian voters prioritize employment and basic amenities (like healthcare, drinking water, better roads etc.) above all governance issues (including terrorism and strong defence/military). This indisputably is a result of prevailing governance deficit in these sectors that is causing deprivation to the average Indian voter besides also leading to the denial of their fundamental rights like right to live with human dignity as embodied in the Article-21 of the Constitution. For inclusive and equitable development, it is important that the government ensures that such basic services reach all sections of the society, as it is key to developing human capabilities. 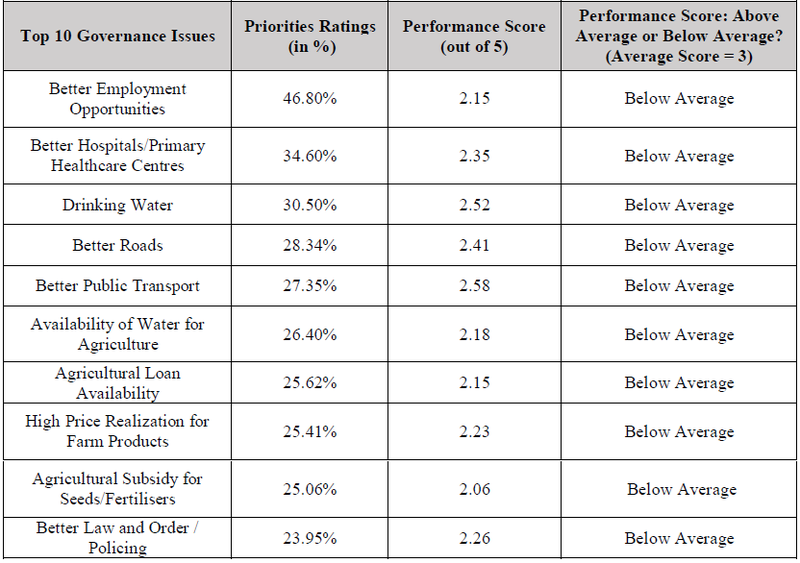 The government’s performance score on the top 10 voters’ priorities is below average. This evidently indicates that the voters are unsatisfied with the government’s performance. Hence, the government needs to prioritise and invest more particularly in these sectors. On better employment opportunities, which is the top most voters’ priority, the performance of the government has been rated as one of the worst (2.15 on a scale of 5).  As per All India Survey 2018, better employment opportunities (46.80%), better health care (34.60%) and drinking water (30.50%) are the top three voters’ priorities at the all India level, followed by better roads (28.34%) and better public transport (27.35%) at the fourth and the fifth place, respectively.  It is important to note that agricultural related governance issues featured predominantly in the all India top 10 voters’ priorities e.g. 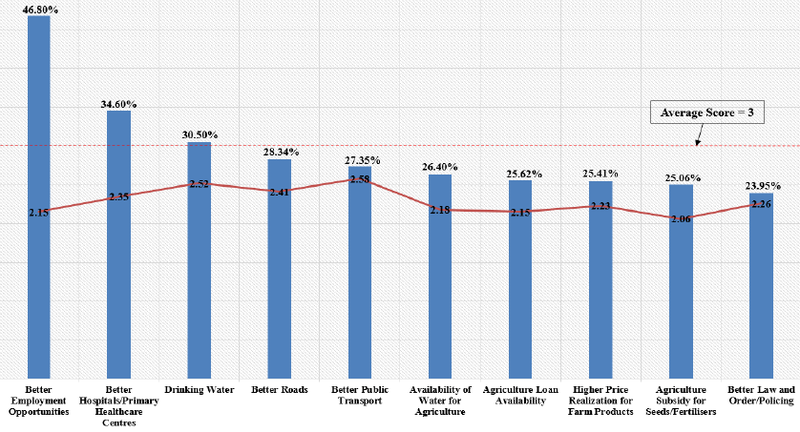 Availability of water for agriculture (26.40%) that was ranked sixth, agriculture loan availability (25.62%) that was ranked seventh, higher price realization for farm products (25.41%) that was ranked eighth, and agriculture subsidy for seeds/fertilsers (25.06%) that was ranked ninth.  The other top two voters’ priorities, better healthcare (2.35) and Drinking Water (2.52) were also rated as below average. Better healthcare was ranked seventh and Drinking Water was ranked third.  It is a matter of serious concern that for none of the 31 listed voters’ priorities, the performance of the government was rated as average or above average.  The worst performance of the government, as rated by the voters, were on the issues of encroachment of public lands, lakes etc., terrorism, training for jobs, strong defence/military, eradication of corruption, lower food prices for consumers and mining/quarrying.  The comparative analysis between All India Mid-Term Survey 2017 and All India Survey 2018 reveals that the top two voters’ priorities (better employment opportunities and better hospitals/primary healthcare centres) have continued to remain at the top.  The significance of better employment opportunities as voter’s highest priority has increased by 56.67% from 30% in 2017 to 47% in 2018. At the same time, the performance of the government on this issue declined from 3.17 to 2.15 on a scale of 5.  The significance of better hospitals/primary healthcare centres as voter’s second highest priority has increased by 40% from 25% in 2017 to 35% in 2018. At the same time, the performance of the government on this issue declined from 3.36 to 2.35.  The significance of drinking water as voters’ priority has increased by 150% from 12% in 2017 to 30% in 2018. At the same time, the performance of the government on this issue declined from 2.79 to 2.52.  The significance of better roads as voter’s priority has increased by 100% from 14% in 2017 to 28% in 2018. At the same time, the performance of the government on this issue declined from 3.1 to 2.41.  Amongst the 32 states and UTs that were surveyed, in 29 of them, voters have given below average ratings to the government for its performance on all top 3 voters’ priorities at the state level. This is with the exception of Dadra and Nagar Haveli, Daman and Diu and Puducherry.  Out of all the 8 Empowered Action Group (EAG) states, which are considered as most socio-economically backward, in seven states (Bihar, Chhattisgarh, Jharkhand, Madhya Pradesh, Rajasthan, Uttarakhand and Uttar Pradesh) better employment opportunities is the foremost voters’ priority.  Drinking Water is the topmost voters’ priority in 3 States/UTs like Odisha, Karnataka and Daman and Diu.  As per All India Survey 2018, 75.11% voters disclosed that CM candidate was the most important reason behind voting for a particular candidate, followed by candidate’s party (71.32%) and the candidate (68.03%) himself/herself.  It is distressing to see that for 41.34% voters, distribution of cash, liquor, gifts etc. was an important factor behind voting a particular candidate in an election.  In relation to voting candidates with criminal antecedents, maximum number of voters (36.67%) felt that people vote for such candidates because they are unaware of his/her criminal records. 35.89% voters are also willing to vote for a candidate with criminal records if the candidate has done good work in the past.  Although, 97.86% voters felt that candidates with criminal background should not be in Parliament or State Assembly, only 35.20% voters knew that they could get information on criminal records of the candidates.